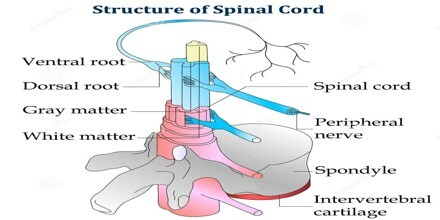 Spinal Cord is the long, cordlike part of the central nervous system that is enclosed within the vertebral column (spine) and descends from the base of the brain, with which it is continuous. 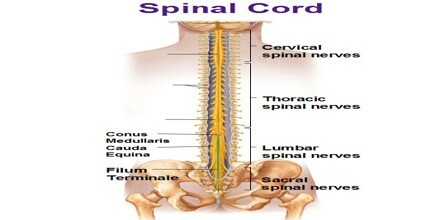 The spinal cord branches to form the nerves that convey motor and sensory impulses to and from the tissues of the body. Thirty-one pairs of spinal nerves originate in the spinal cord: 8 cervical, 12 thoracic, 5 lumbar, 5 sacral, and 1 coccygeal. Part of the central nervous system, the spinal cord is an ovoid column of nerve tissue 40 to 50 cm long that extends from the medulla to the second lumbar vertebra; it is within the spinal (vertebral) canal, protected by bone, and directly enclosed in the meninges. In the human the spinal cord begins at the occipital bone where it passes through the foramen magnum, and meets and enters the spinal canal at the beginning of the cervical vertebrae. The spinal cord extends down to between the first and second lumbar vertebrae where it ends. The enclosing bony vertebral column protects the relatively shorter spinal cord. It is around 45 cm (18 in) in men and around 43 cm (17 in) long in women. Spinal Cord consists of nerve fibers that transmit impulses to and from the brain. Like the brain, the spinal cord is covered by three connective-tissue envelopes called the meninges. The space between the outer and middle envelopes is filled with cerebrospinal fluid (CSF), a clear colorless fluid that cushions the spinal cord against jarring shock. It is also a center for coordinating many reflexes and contains reflex arcs that can independently control reflexes and central pattern generators. Spinal Cord is the pathway for sensory impulses to the brain and motor impulses from the brain; it also mediates stretch reflexes and the defecation and urination reflexes. Thirty-one pairs of spinal nerves emerge from the spinal cord and innervate the trunk and limbs. The center of the cord is gray matter in the shape of the letter H; it consists of the cell bodies and dendrites of neurons. The ventral (anterior) horns of the gray matter contain cell bodies of somatic motor neurons; the dorsal (posterior) horns contain cell bodies of interneurons. The white matter is arranged in tracts around the gray matter. It consists of myelinated axons that transmit impulses to and from the brain, or between levels of gray matter in the spinal cord, or that will leave the cord as part of peripheral nerves. It is continuous with the caudal portion of the medulla, running from the base of the skull to the body of the first lumbar vertebra. It does not run the full length of the vertebral column in adults. It is made of 31 segments from which branch one pair of sensory nerve roots and one pair of motor nerve roots. Nerve fibres carrying signals from the brain join motor nerve roots leaving the front of the cord. The spinal cord is elliptical in cross section, being compressed dorsolaterally. Two prominent grooves, or sulci, run along its length. The posterior median sulcus is the groove in the dorsal side, and the anterior median fissure is the groove in the ventral side. Electrical Communication – Electrical currents travel up and down the spinal cord, sending signals which allow different segments of the body to communicate with the brain. Walking – While a person walks, a collection of muscle groups in the legs are constantly contracting. The action of taking step after step may seem incredibly simple to us since we have been doing it all of our lives, but there are actually a lot of factors that have to be coordinated properly to allow this motion to occur. This central pattern generator in the spinal cord are made up of neurons which send signals to the muscles in the legs, making them extend or contract, and produce the alternating movements which occur when a person walks. Reflexes – Reflexes are involuntary responses resulting from stimuli involving the brain, spinal cord, and nerves of the peripheral nervous system. 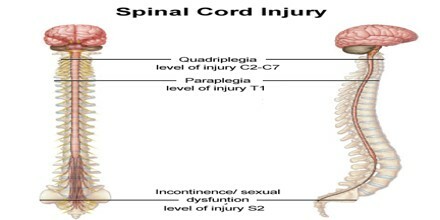 Spinal Cord Injury (or SCI) is when a part of the cord or the nerves located at the base of the spine are damaged. This can have a major effect on the body’s “sensory, motor, and reflex capabilities if the brain is unable to send information past the location of the injury.” The major nerve of the hip and thigh, the sciatic nerve, is the most vulnerable nerve in the body. Damage to this nerve causes a condition known as sciatica. A spinal cord injury occurs when there is damage to the spinal cord either from trauma, loss of its normal blood supply, or compression from tumor or infection. The first step in treatment of a suspected spinal cord injury is to verify the patient is breathing and the heart is beating. 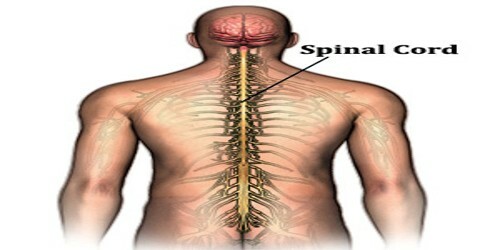 A spinal cord injury in the upper neck can cause a loss of control of normal breathing. This may require the placement of a breathing tube and use of a ventilator. The next step in treatment of a spinal cord injury is immobilization. This often occurs at the time of injury prior to being transported to the hospital. Emergency medical technicians may place the patient in a cervical collar or on a backboard to help prevent the spine from moving. 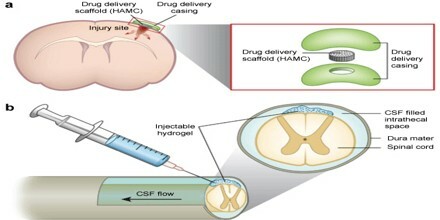 Replacement of lost cells is facilitated by transplants with embryonic stem cells, stem cells from the spinal cord, and spinal cord cells from fetuses. Reference: medicinenet.com, dictionary.com, spinalcord.com, wikipedia.